Yesterday, I went to a nearby supermarket with my 4 year old daughter. She has been insisting me to buy her a strawberry flavored breakfast cereal. Though I'm totally against such ready-to-eat packaged cereals, I do give into her demand once in a while for a smaller pack size. I don't want to completely ban such products in my home as the kid might start developing a craving and give more importance to such foods. In the last couple of weeks, whenever we go shopping, she would ask me for the strawberry cereal but we couldn't get a smaller pack. "D, I will buy it only when we get a smaller pack", I told her. She spotted a smaller pack yesterday and brought it to me. "Mumma, see…I found a small pack", she handed it to me with a big smile. I kept my promise and bought one. The product was made with ragi flakes and claims "deliciously healthy" (now you know which brand it is!). This morning, she promptly remembered during breakfast and was having this cereal with milk. I was looking at the ingredients which has now become a well-ingrained habit. As suspected, many not-so-good stuff were there - hydrogenated vegetable oil, edible palm oil etc. And there was also a line - "hydrogenated vegetable oil contains transfat". I casually remarked to her, "D, this is also junk food, you know. It has transfat". She asked me in an innocent tone, "transfat means?" I replied "your heart doesn't like transfat, baby. Show me where your heart is". She pointed it correctly and thought for a second. "Mumma, it's okay. I ate very little no? So it's good food"
My daughter and I have such conversations quite frequently. She loves her lollipops, kinder joy and cream biscuits, like any other child of her age. But she also understands that she cannot eat them frequently. I strongly believe that the current generation of kids need to be educated about the food choices that they make, the good and the bad and how it impacts them. The exposure of packaged foods they get through media, billboards, supermarket shelves and through peers make it all the more important. Creating awareness at a young age helps them take the right decisions as they move into their teens and adulthood. This task of building awareness has to be owned by both teachers as well as parents. It's a sad situation that kids get to learn more about math and science but they know very little about their food, cultivation process, local produce, nutrition, healthy eating habits etc. Sharing with you three tips that are working well for me towards building awareness on healthy eating practices for my little one. I'm perfectly okay with her reaction and I don't expect her to gobble up a portion of savory ragi adai. I might try a sweet version next with jaggery. My intent is to let her explore local cuisine, try different healthy dishes and make her own choices. Our generation atleast had some exposure to such ancient food wisdom from our grandparents and it's our responsibility to carry it forward to our children. 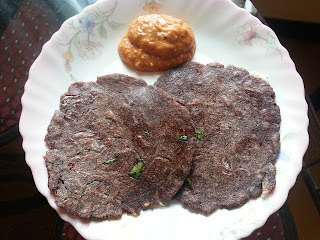 It's so easy to order a burger or a pizza than it is to get a ragi adai or a kambu paniyaram. That's the sad state of affairs in our urban city life! For Sunday lunch, I made both white rice and little millet (saamai), along with drumstick sambhar, carrot stir fry and brinjal dry curry. It came as a surprise when she said "I want millets with sambhar" and it made me so happy to see her eat millets. I never force her to eat healthy foods but I ensure there's healthy options for her to choose from. Kids love to make decisions, so give them a few options and let them pick. It doesn't take too much time on your end if you plan ahead. D loves almost all fruits. I make sure there's enough variety of fruits stocked up at home - mostly seasonal. A few months back, she was asking me to buy mangoes. I then talked to her about seasons, months and the fruits available in each month. When we visited a farm sometime end of Dec, she saw a mango tree that didn't have any mangoes. It helped me to reinforce the concept of seasons and now she accepts that mangoes are only available from April. Do share if you find these tips helpful and also how you talk to your children on inculcating healthy eating habits.